The geese are starting to hatch out back of the shop. A few days ago while riding my bicyle home, I ran into this family of geese, mother, father and eight goslings on the other side of a cyclone fence that keeps people away from the water. I stopped, intending to take a picture of the happy family but realized that I had forgotten my camera. I had to settle for just looking at them. As I got closer to them, the father got into his protective role, lowered his head and hissed at me. And then I noticed, off to the left, at a safe distance from the protective father, a crow, watching for straggler goslings and the chance of a meal. Coincidentally, three crows had showed up at the shop just a few weeks earlier, no doubt just in time to take advantage of the impending gosling season. A few more days went by and a visiting friend told me of a crow with a broken wing that he had seen on the way in to the shop. Ah, crow with a broken wing. No doubt some unfortunate accident, but then it occurred to me that the crow might have gotten a little too bold and run afoul (afowl) of the father goose who had possibly broken his wing. 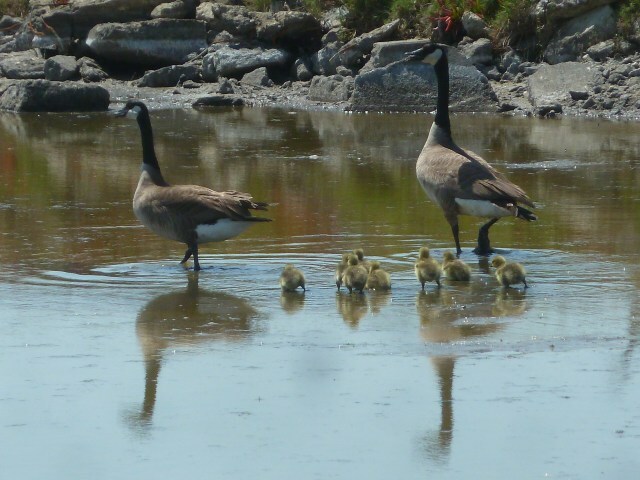 We can't know for sure, but for sure I got some pictures two days ago of all eight goslings still waddling and swimming about with their protective parents flanking them.